When it comes to elliptical trainers for home, Schwinn provides some of the best quality, functionality and value for money in the market. Those two ellipticals are Schwinn 430 and Schwinn 470. They are both excellent home fitness gym machines. But, there must be things that make them different. These things are for those who want to make the right option because, they are for sure, will be very confused. Reading an article is one of their solutions. Reading Schwinn 430 vs Schwinn 470 is also one of solution for you all in looking for a home treadmill. With a lot of benefits, the Schwinn 430 provides with a high speed inertia perimeter weighted flywheel. This ensures that you get a smooth, natural revolution each time. The pedals of 430 are set at the ideal height to allow you to easily get on and off, it is also nice and wide that will make your feet have plenty of room to move without your toes hitting the sides.The stride length of the 430 is 20 inches and the dual console of the 430 monitor allows you to place a tablet on the console and watch your favorite Netflix show while you’re working out. There is hand grips to allow for an easy reading of your training heart rate. It is built-in fan that you can actually tilt. This allows you to focus the breeze just where you need it the most. And last but not least, Schwinn 430 provides you with two sets of handles. One set is movable, mimicking the natural stride motion of your feet. The other set is fixed, allowing you to rest your arms when you wish to focus on a lower body workout. Schwinn 470 is backlit. It allows you to be able to easily see your training diagnostics as displayed on the screen. The 470 gives you a 20-inch stride length, which is a couple of inches more than you’d get with most other home ellipticals. The 470 is the only Schwinn elliptical to offer it. It means that you can instantly adjust the angle of the incline from the console without stopping your workout. The pedals is cushioned articulating foot pedals with ergonomically designed to follow the motion of your ankle as you move. If your tablet or smartphone is low-battery, you can charge them on 470 while you are working out. Schwinn 470 connect fitness app allows you to upload all of your training data to your tablet or phone for detailed app analysis. It will provide you a wealth of useful diagnostics, including tracking your goal progress. And the Schwinn 470 has two sets of handle bars. The main set moves in tandem with the stride motion of the pedals, allowing you to work the upper and lower body together. The secondary set of handles are located under the console and are for when you want to only work your lower body. 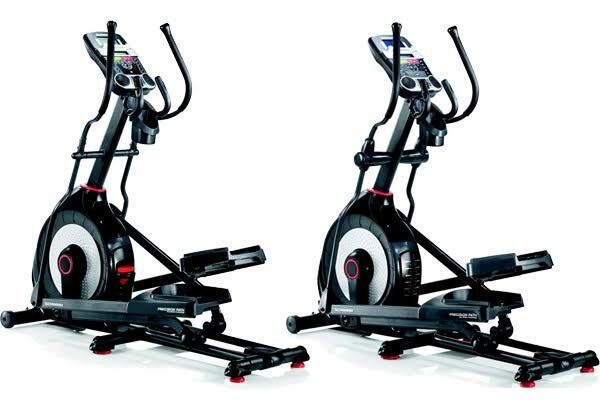 Both the Schwinn 430 and Schwinn 470’s console features dual LCD windows to display motivating workout stats such as time, distance, speed, calories burned and pulse heart rate. However, the displays are slightly different in that the Schwinn 470 has a blue backlit display which the Schwinn 430 doesn’t have. The Schwinn 430 is not telemetry enabled like the Schwinn 470 is, but both bikes have pulse-grip heart-rate monitors built into the handlebars.